What’s The Church Supposed To Do? If you ask the church that I’ve spent most of my life in what their mission is they have a ready answer: preaching the gospel and preparing a people. I can’t speak for your churches, but I imagine many (perhaps even most) of them would also point to some version of what we call The Great Commission as their mission statement. Is this a commission? yes, it’s “an instruction, command, or duty given to … group of people.” Is it great? since it came from Jesus and involves a responsibility given His disciples, yes. But is it really meant as the defining mission statement for the entire church from Jesus’ resurrection to His return? I’m not so sure. The religious leaders of Jesus’ day were the group He spent the most time criticizing and correcting. They professed to follow God’s highest standards but were in reality hypocrites. They did righteous looking things just to get attention (Matt. 23:5). They went to great lengths to convert people only to pervert their faith (Matt. 23:15). They placed too high an emphasis on money received as tithes and offerings (Matt. 23:16-19). They neglected the “weighty matters” of God’s law and instead followed their own traditions. They even turned the temple itself into a marketplace where they exploited people coming to worship God (John 2:14-16). The scary thing is, these people honestly thought they were the most righteous God-followers out there. That serves as a warning today that church leaders and organizations have to be very careful where they place their focus. And so do we as individual members of Christ’s body. We certainly shouldn’t ignore Christ’s instruction to go, disciple, baptize, and teach. 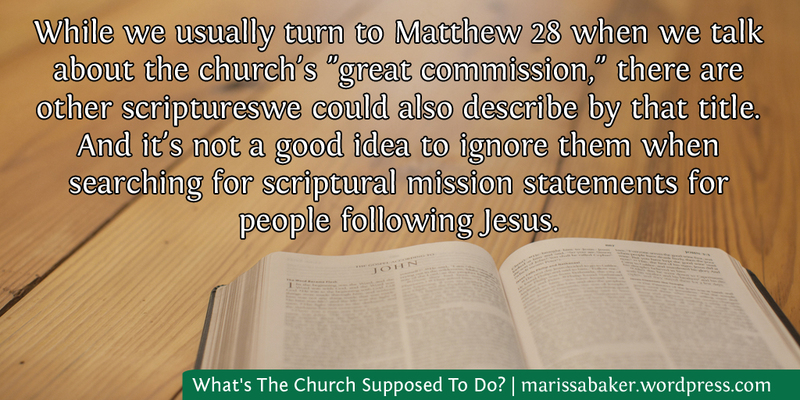 But we need to make sure we’re thinking of that command from Matthew 28 in its proper context. 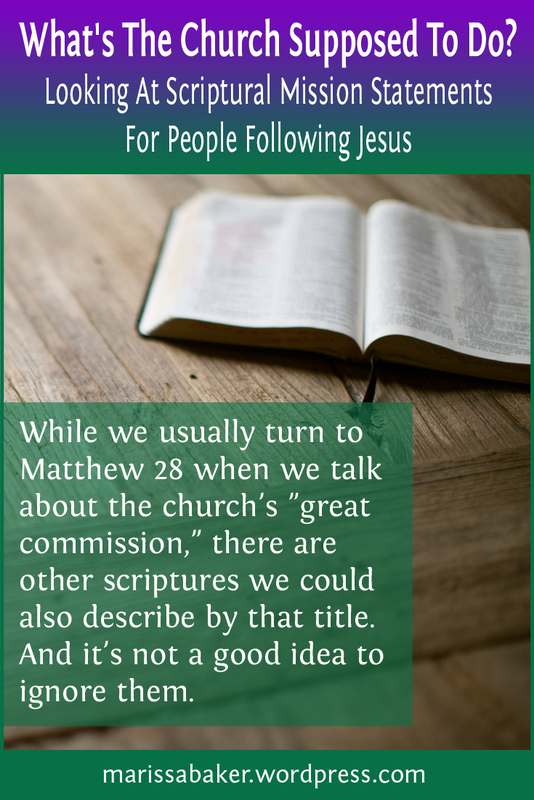 Because there are two other commissions that Jesus plainly told us are His greatest commands. Love (and the Greek word here is agape) is the church’s mission statement. It’s not as marketable as preaching the gospel, but it has to be the first priority of people following Jesus. Without that as the “instruction, command, or duty” that we recognize as greatest in our lives, the other things we do will be as empty as the pharisees’ works. In James’ letter, he tells us that pure, undefiled religion is ” to visit the fatherless and widows in their affliction, and to keep oneself unstained by the world” (James 1:27, WEB). And in Jesus’ last discourse (which is another candidate for the title “great commission”), He says His followers should focus on serving and loving others while bearing much fruit for the Father’s glory (John chapters 13-16). Genuine concern for other people’s well-being is what defines Jesus’ disciples. If we don’t treat other people well and truly care about them, they’re unlikely to listen as we preach the gospel. No one wants to hear about God’s love from someone they see as judgemental and/or impersonal. You’ll notice reading the gospels that throughout Jesus’ ministry, He healed and fed people while teaching them about God. He knew the value of holistic ministry, not just abstractly focusing on a person’s soul (James 2:15-17). I hear from far too many Christians whose worst hurts at the hands of other people happened in the church. Often, they were hurt by those in ministerial roles (which is something God says that He hates). Things like that shouldn’t be happening in the churches of God! We all need to live our faith before and while we try to share it. We need a foundation of love so when new people come into the church they’re welcomed as Jesus would want rather than exploited. It’s interesting to look at how the apostles preached the gospel in the years after Christ’s resurrection. They didn’t have things like TV, billboards, or printing presses like we do. Perhaps they would have used those resources, but I suspect they still would have spent the bulk of their time traveling in-person to talk with people and meet them where they are. The personalization of Paul’s preaching is astonishing. In Damascus, he debated with the Jews to prove Jesus is the Messiah (Acts 9:20-22). In Athens, he told the Greeks they were already worshiping God ignorantly under the title “the unknown God” and quoted one of their own poets to support his argument (Acts 17:22-28). In Corinth, he opted not to wow his listeners with intellect but rather focus on demonstrating the power of God (1 Cor. 2:1-5). He couldn’t have reached so many people in exactly the right way if he wasn’t interacting with them directly. Similarly, we need to know and care about people we’re preaching to in a way that’s as close as possible to the way God knows and cares about them. Preaching the gospel isn’t the church’s first or even second priority. The first is to love God and the second to love everyone else. Only then can we care about His message enough to share it the way He wants and care about the listeners enough to share the gospel in the way that’s best for them to hear. What we call the “great commission” wasn’t meant to be the big, defining mission statement of the church. Rather, it’s one of the important things the church does because of God’s greatest commission: to love Him will all you are and to love your neighbor as yourself. Good sabbath Marissa! Loved this perspective, thank you for sharing it!